Step 1: Eat Enough Fats: dietary fat is necessary for the production of hormones and the regeneration of the body. Step 2: Stop Doing The Wrong Exercise: Running and other forms of long-duration exercise increase free radicals and may speed up the aging process. Step 3: Stop Blaming Everything On Your Age: you are not doomed to become fat and lose muscle mass, because you are getting older. It has been proven that even men and women in their 90s are able to gain muscle tone. Step 4: Drink Enough Water: water is essential for your skin, fat burning and your overall health. Step 5: Work Out Less: strenuous exercise should be avoided. The authors believe that old school resistance training is all you need to preserve your muscle mass and reap all the health benefits of exercise. Thy have developed the F4X Training System that combines four specific exercises and only takes a couple of minutes per day. Now, are these 5 steps enough to reverse the aging process? The truth is that even though these tips can be helpful, aging cannot be reversed. However, you can slow it down and this program will help you do just that. In fact, in the ebook “Anti-Aging Secrets”, which is part of the program, you will find some very interesting information. For example, did you know that eating a banana before bedtime will help you sleep, because it helps your body produce melatonin and serotonin? Or that creatine supplementation can reduce mental decline in the elderly? Or that coffee reduces the risk for Parkinson’s and Alzheimer’s? In the “Ultimate Fat-Burning Secrets” ebook, they claim that a capsaicin can help you burn fat, because a certain study showed that fat cells exposed to capsaicin in the lab died. The problem is that an in-vitro study doesn’t translate into real life results. You can’t directly expose you fat cells to capsaicin, by eating chilli peppers. In the same ebook as well as in the main manual, you will find the advice to eat many times per day, in order to lose more weight and boost your metabolism. In fact, Steve and Becky Holman claim that not eating for a few hours will put your body in starvation mode and make you unable to lose fat. Although, this is a very common advice, it’s not supported by the latest evidence. The metabolism doesn’t slow down after a few hours of abstaining from food. It takes days for this to happen. As for starvation mode, you probably have nothing to worry about. 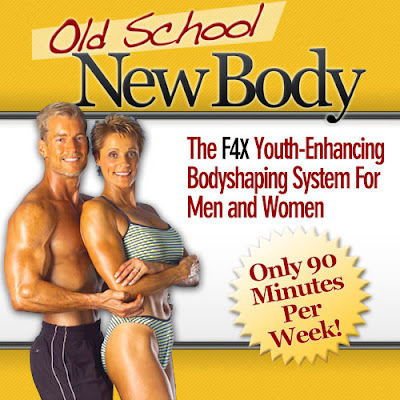 Old School New Body Review is a pretty good program, especially for people over the age of 40 or 50. If you want to build a lot of muscle, this may not be the best choice for you. If you have a lot of weight to lose, there are better programs out there. But, if your goal is to preserve your muscle mass and slow down the aging process, then you will certainly benefit from this system. Click Here To Download Old School New Body From Official Website!